Resupply a Friendly Control Point in The Division 2 is a type of side activity you can take up in the game. It requires you to deliver a certain amount of different supplies to a friendly Control Point in the Division 2. These include food, water, components, etc. The problem people have been having is how to resupply Division 2 friendly control points. The mission is vague, and really doesn’t clue you in on what you’re supposed to do. In case this is giving you headaches, then our Division 2 Resupply a Friendly Control Point – How to Complete guide is the right place for you. How to Resupply a Friendly Control Point in Division 2? To resupply a friendly control point in Division 2, you’ll have to liberate the control point, then give the necessary supplies to the Control Point Officer. This becomes possible after you free the Theater Settlement. Let’s take the Downtown East Liberation mission, which requires you to resupply a friendly Control Point up to 50. 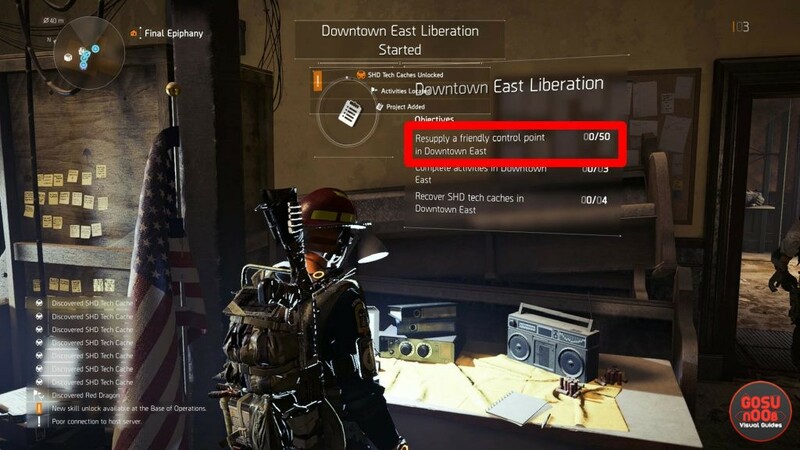 To complete this mission, you have to free one or more control points in the Downtown East area, like the Fallen Cranes Control Point, for example. Basically, any and all Control Points in the area will do. These are useful, because the more friendly Control Points you have, the less enemies crawling around the streets you need to worry about. Once you’re done with that, find the local Control Point Officer. It’s not to hard, because it will say Control Point Officer above the NPC’s head. In our case, the officer of the Fallen Cranes Control Point was a black guy in a dark red and blue shirt. Talk to the officer, then select what you want to donate, then just press and hold the Donate button. In this case, you can spread out your donations across several friendly Control Points, or just put all 50 into one. However you do it, you’ll complete the Resupply a Friendly Control Point mission. If the game is giving you problems with something else, you might want to take a gander at some of our other Division 2 guides. Among others, we’ve got How to Restart Bounty, When Can you Create a Clan, and Hyenas, True Sons, Outcast Key Locations. How do I complete this when control points no longer require supplies? Well, I mean… If they no longer need supplies, I assume that would mean that you’ve completed the task, right? Says I still need supplies. What specifically do i need to be looking for to finish the task?